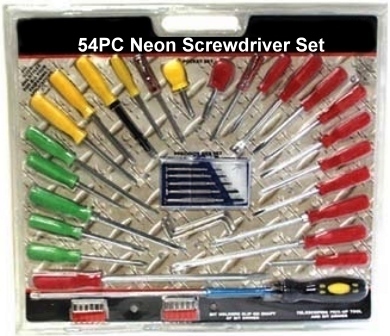 This 54 Piece Neon Screwdriver Set with high visibility neon handles and hardened steel shanks with precision ground ends Includes 24-pc. Mechanic's handle screwdrivers, 6-pc. Micro screwdrivers, a universal screwdriver with Telescopic Pick Up Tool and 17-pc. Screwdriver bits. Manufacturer: Illinois Industrial Tool. Set is Approx. 3 lbs.